After half a year and a lot of work by our amazing Historian, Jon Axline, yesterday Primrose Station’s NRHP application was voted on in Seeley Lake. Although we were out-of-town and couldn’t attend, it was very exciting to hear from Mr. Axline that our State Historic Preservation Office voted unanimously in favor of our application! The finalized application should be in the register by 01July. I’m too excited to wait that long so I’m publishing most of the text of the draft nomination here for posterity. The beginning is a technical description of the architecture of the building, but if you scroll down you’ll find a history of the MILW and our building in particular! Original plat map showing the location of other buildings. Milwaukee Road Railroad Substation No. 10 is located on Mullan Road (Montana Secondary Highway 263) about ten miles west of the City of Missoula in Missoula County, Montana. The substation is situated in the northwest quadrant of the junction of Mullan Road and Primrose Drive and faces south toward Mullan Road. The substation was a significant component of the railroad’s electrified section between Harlowton, Montana and Avery, Idaho from 1915 to 1974. It was one of 22 substations on the line and the best preserved of the four existing substations in Montana. The abandoned Milwaukee Road Railroad grade (24MO0713) passes by the substation to the south. The T-shaped substation is 87 x 74 feet fronting on the abandoned Milwaukee Road Railroad grade. The building is composed of brick and has a flat roof. Large windows on the substation’s south façade indicate that natural sunlight illuminated much of the interior. The substation is divided into two sections: the section that housed the motor-generator sets and the operator’s office, and the 2½ story section, which sheltered the transformers and switches. The 2½ story section still has the original lightning arresters and dissipaters (horn gaps) on the roof. The rather austere appearance of the substation is accented by recessed bays and brick detailing on all four sides of the building. The entry vestibule on the façade of the substation has a decorative brick cornice. Milwaukee Road Substation No. 10 is a T-shaped Industrial-style brick building that was constructed in 1915 by the Chicago, Milwaukee and St. Paul Railroad (Milwaukee Road). The building consists of a 2½ story with a two story section attached on the south facing the abandoned railroad grade. Both sections are integrated by a corniced brick header string course and a decorative 20-inch wide brick water table. Brick pilasters divide the walls into bays on all four sides of the building. A header brick continuous sill girdles the second story windows. All windows are warehouse-type multi-lite casement units that were designed to provide natural lighting and supplement ventilation to the electrical equipment inside the building. The substation rests on a plinthed concrete foundation. The building has a flat roof with parapet walls sheathed in asphalt. The 2½ story section still displays the original lightning arresters and dissipaters (horn gaps) associated with its function as a substation for an electrified railroad. The walls are comprised of red brick laid in running bond with a brick header cornice. Tiles are situated on the roof cornice, terracotta tile on the roof edge. Entries are located on the façade and west elevation of the two-story section of the building. The substation is oriented north and south and faces south onto the abandoned Milwaukee Road Railroad grade, which is located a few yards south of the substation and now functions as an access road to a residence. The substation was the most distinctive feature of the Milwaukee Road’s Primrose railroad station. The south section of the building is 53 x 17 feet and is divided into recessed bays by brick pilasters. It obscures much of the south façade of the 2½ story section of the building. This section housed the motor-generator sets which stepped the 100,000 volt alternating current (AC) that entered the building down to 3,300 volts direct current (DC) that was distributed to the locomotives. This section also contained the switches used to control the amount of electricity fed to the lines powering the locomotives. The second floor has three window openings each with 30-lite casement windows. The central and west bays are occupied by two 100-lite casement windows that are currently protected by fiberglass sheets. A 17 x 5 foot gable roofed brick vestibule occupies the east bay and projects from the east façade. It was the location of the substation operator’s office, the ticket window, and a waiting room. The copper electrical catenary wires entered and exited the building through conduits through openings on the façade above the window. An I-beam and angle section structure also supported the wires that provided power to the locomotives and projects from the wall above the vestibule’s central window. The vestibule roof is sheathed in asphalt and has a tile cornice with a brick header course and a corniced string course. A sandstone plate with “Substation No. 10” etched into it is situated on the gable-end. A 50-lite Industrial-style casement window occupies most of the façade (it is currently protected by a fiberglass sheet). The window opening has a flat arch lintel with header bricks and the sill also has header bricks. The entry to the substation is located on the east elevation of the vestibule. It has a large fixed-lite transom and the original wood paneled door with a single fixed lite. The west elevation of the vestibule has a window opening with a *-lite industrial style window that allowed the operator a view of the track to the west. The second floor has two 30-lite casement windows. There are no window openings. The concrete foundation is extended 14 x 8 feet at the ell. According to the standard substation design, it was designed to support a small flat-roof brick addition. It is not known if an addition was ever located here as modifications were made in the standard design according to the site needs. The foundation currently supports a metal grate installed to supplement the ventilation of the machinery inside the building. The fenestration on the west elevation is the same as the east. The window openings on the second floor and the window type are the same as the east. On the ground floor, however, a window opening occupies the south bay of the elevation; it is currently protected by a fiberglass sheet (the original window muntins are still intact, however). The north bay contains an entry that has the original double leaf wood doors. The doors are comprised of vertical boards with exterior braces. Both doors have a 4-lite transom and the north bay door has a man entry with a modern wood door installed. This entry was accessed by a railroad spur. The spur and tracks terminated inside the building, allowing the railroad to remove and replace the heavy equipment in the building. On the pilaster between the recessed bays there are metal rungs embedded in the wall that provide access to the roof of the substation. The north section once housed the high tension transformers and switches for the substation. It is 2½ stories tall. All of the multi-lite industrial style window panes on the façade and rear of the section windows on the façade have been broken out. There are seven twelve-lite Industrial-style casement windows on the second story of the south façade of the substation. The central bay of the second floor exhibits paired 12-lite casement windows. The central bay of the ground floor has a window opening that once held a 72-lite casement window. The opening is currently in-filled with plywood sheets. The west elevation has the same configuration as the east elevation, including the paired multi-lite casement windows on the second floor. The window opening on the ground floor has been enlarged, possibly in the 1970s when the electrical machinery was removed from the building. It once held a 72-lite casement window. The opening is currently in-filled with plywood sheets. The second floor of the rear façade has three sets of paired 12-lite casement windows corresponding to three of the five bays. All of the glass in the windows is no longer extant. The ground floor has three windows openings that are missing the muntins and are partially in-filled. This section has a flat roof sheathed with asphalt. Parapet walls encircle the roof on the south, east, and west. The original electrical equipment inside the substation was removed and salvaged by the Milwaukee Road in the late 1970s. The two sections are divided internally by a brick wall. The wall has a large opening with a steel plate door and a man-entry. The north section also has a large pit along the north wall that facilitated the ventilation of the equipment once located there. The front section of the building could be accessed by a railroad spur. In keeping with that function, a ten-ton, hand-operated traveling crane is still located in the front section of the building. Also located there is a two section machinery bay separated by brick partitions and conduits through which wiring could pass between the two sections of the building. The interior has a concrete floor. The interior reveals that trusses were used to support the roof of the motor-generator sets section of the building, while steel I-beams supported the roof of the 2½ story section – just as indicated in the standard Milwaukee Road substation plans. The Primrose Substation has excellent integrity. The building retains all of original architectural detailing and footprint, and features standard to the design development by the Milwaukee Road Railroad in 1915. The fenestration is largely intact as are the original windows. Openings on the east and west elevations have been in-filled with plywood sheets, but the openings themselves have not been altered. The brick walls still retain their original detailing and the lightning arresters and dissipaters on the roof are intact along with the catenary support on the façade. The building exhibits enough of its original appearance to strengthen its association as a Milwaukee Road substation. The setting of the property has diminished somewhat with the cessation of railroad activities on the Milwaukee Road and the removal of the tracks, ties, ballast, and other appurtenances associated with the line. The abandoned grade, however, is still extant and observable as is the substation’s association with it. All but one of the buildings and structures associated with the substation have been removed, but their elimination does not significantly detract from the overall integrity of the building. There are no intrusive buildings or structures located in close proximity to the substation. The Primrose Substation is eligible for listing in the National Register of Historic Places under criteria A and C. The building is eligible under Criterion A for its association with the Chicago, Milwaukee, St. Paul and Pacific Railroad (Milwaukee Road), the third transcontinental railroad to cross Montana. It is also associated with the Milwaukee Road’s electrification of its line between Harlowton, Montana and Avery, Idaho in 1915. The electrification enabled the railroad to efficiently traverse the Rocky Mountains and made the line one of the most technologically advanced in the United States at the time. The substation was a critical component of that electrified line. The Milwaukee Road had a significant impact on the agricultural and commercial development of the state between 1909 and 1980. The substation is also eligible for the National Register under Criterion C as representative of the standard design for Milwaukee Road substations developed by the railroad’s architects in 1914. The building is an excellent and intact example of this architectural style with its footprint, fenestration, and architectural detailing intact and unchanged. It is also the most undamaged remaining Milwaukee Road substation in Montana. It retains excellent integrity of design, materials, workmanship, and feeling. The Primrose Substation is eligible for the National Register under Criterion A because of its association with the electrification of the Milwaukee Road in 1915, “an historic step . . . thus far unprecedented in the history of American railroads.” The railroad had a reputation in the early twentieth century as the most technologically advanced line in the United States, largely because of the electrification of its Pacific Extension in 1915. The Primrose Substation was a critical component of that system. The Primrose Substation was one of thirteen substations strung along the length of the Milwaukee Road’s Rocky Mountain Division between Harlowton, Montana and Avery, Idaho, a distance of 440 miles. It is one of only four substations remaining in Montana. The Milwaukee Road had a significant impact on the economy of Montana and the electrified section carried freight from and destined for Montana consumers. The substation was also important to the operation of the Milwaukee Road’s passenger trains, such as the Hiawatha and Olympian Hiawatha. The Primrose Station also served as a railroad station and was important to the development of this section of the Missoula Valley. The Primrose Substation is emblematic of the standard Milwaukee Road substation design and was in use between 1915 and 1974. It is the most intact example of this design remaining in Montana. The substation is also eligible for the National Register under Criterion C as an excellent and intact example of this particular architectural type. The substation was constructed from a standard plan developed by Milwaukee Road Railroad architects in 1914. The fenestration, footprint, and architectural detailing standard to this design are intact and unchanged. It is recognizable as a Milwaukee Road substation and its appearance has not been altered since its construction in 1915. The setting of the property has diminished somewhat with the removal of the railroad tracks and buildings associated with its operation from 1915 to 1974, but the essential characteristics that make this building eligible for the National Register are intact and in good condition. The Lewis and Clark Expedition and British North West Company agent David Thompson were the first known Euro-Americans to provide descriptions of the Missoula Valley when they visited it in 1806 and 1812. The valley was part of the aboriginal territory of the Salish, Pend d’Oreille, and Kalispell people and provided a link between the Bitterroot Valley to the south and the Jocko Valley to the north. The valley’s central location made it an important gathering place for Native Americans and, by the 1820s of the British Hudson Bay Company. In 1846, Great Britain relinquished its on what had become known as Oregon Territory, turning it over the United States south of the 49th parallel. The HBC, however, remained active in the area, as did American fur companies. American influence in the area became much more pronounced in 1841, when the Jesuits established St. Mary’s mission in the Bitterroot Valley about forty miles south of the substation. In 1850, Major John Owen purchased the mission site and converted it to a trading post known as Fort Owen. In 1853, the federal government initiated surveys to determine potential routes for a transcontinental railroad. Isaac Stevens drew the assignment for the northern transcontinental route across the northern Rocky Mountains and Pacific Northwest. In 1855, Stevens met with representatives of the Salish, Pend d’Oreille, and Kootenai tribes at Council Grove about a mile south of the future site of the Milwaukee Road substation. They managed to hash out a treaty that established a reservation and allowed the federal government to build roads across their territory. Five years later, in 1860, Lieutenant John Mullan constructed a 624-mile wagon road between Walla Walla, Washington and Fort Benton, Montana. Part of the road traversed the Missoula Valley along the route of present Secondary Highway 263 (called Mullan Road) approximately just south of the substation. The Mullan Road was the route that connected Missoula with nearby Frenchtown, the Cedar Creek Mines near present Superior and, ultimately, the settlements in Idaho and Washington. For a time between 1914 and 1925, the Mullan Road also functioned as a component of one of the nation’s first interstate highways, the Yellowstone Trail. The route, which consisted of a series of interlinked county roads connected Plymouth, Massachusetts and Seattle, Washington. In 1925, the Montana Department of Transportation constructed a new alignment of the highway to the north of the Mullan Road and designated it U.S. Highway 10. The old road became a secondary highway in 1942. The Mullan Road provided the impetus for development in and around the Missoula Valley. In 1860, Christopher Higgins and Frank Worden established a small trading post, called Hellgate, on the road near where the Blackfoot and Clark Fork rivers joined about twenty miles east of the substation. A rough and tumble settlement, Hellgate was quickly eclipsed by a new community, Missoula, in 1862 when Higgins and Worden established a flour mill in the valley. While Missoula steadily grew through the 1860s and 1870s as an important commercial and transportation center, it boomed after the completion of the Northern Pacific Railroad in 1883. The establishment of the Flathead Indian Reservation in 1855 and the allotment of much of its land for non-homesteading in 1910 also made Missoula an important distribution center for supplies destined for the reservation. In 1893, the State of Montana established Montana State University (the University of Montana after 1965) in Missoula, which further strengthened the city as an important metropolitan area in western Montana. From Missoula, NPRR branch lines radiated down the Bitterroot Valley and up the Jocko Valley to Polson at the foot of Flathead Lake. In 1909, the Chicago, Milwaukee, St. Paul and Pacific Railroad (Milwaukee Road) completed its Pacific extension, thus cementing Missoula’s significance as a major transportation hub in western Montana. The City of Missoula continues to experience growth and is now the second largest city in the state. Organized in 1874, the Chicago, Milwaukee, St. Paul & Pacific (Milwaukee Road) Railroad incorporated in Montana in 1905 when company chairman Roswell Miller decided to extend the line through the state to the Pacific Coast. Winston Brothers began construction of the line between Butte and Avery, Idaho in August 1908. The firm employed subcontractors to provide supplies and construct bridges and tunnels along the route. Winston Brothers built different sections of the road concurrently with all segments connected at St. Regis in January 1909. When completed, the 105-mile segment between Missoula and St. Paul Pass was among the most scenic along the Milwaukee Road’s entire westward extension. The Milwaukee initiated passenger traffic on its western extension in 1909. Two years later, in 1911, the railroad’s famed Olympian and Columbian passenger trains began service on the line between Chicago and Seattle. After the section was electrified in 1914, it meant a much smoother and smoke-free ride than what the steam locomotives offered. Indeed, for a small fee, passengers on the Olympian could ride in an open observation car attached to the rear of the train. By far the ultimate in mid-20th century passenger trains was the Milwaukee’s Olympian Hiawatha. Developed by Milwaukee Road engineers in the 1930s, the streamlined art deco-style steam locomotives were among the fastest in the world and the passenger cars were designed for comfort, incorporating the latest technology to make the rides smoother, quieter, and more comfortable than ever before. The distinctive maroon and gold color scheme of the Hiawatha was a common sight to local residents from 1947 to 1961 cruising through the rugged mountains of western Montana at speeds up to seventy miles per hour. Even before the Milwaukee Road had completed its extension westward to the Pacific Ocean, company president A. J. Earling began laying the groundwork to electrify the line in the Rocky Mountain Division, which encompassed 438 miles between Harlowton, Montana and Avery, Idaho. Earling, however, conceived of a plan wherein the railroad would provide its own electricity to power its locomotives. General Electric, at Earling’s direction, had initiated studies regarding the electrification of the railroad. In 1909, however, the Milwaukee Road’s board of directors appointed a new member to represent the Pacific extension, John D. Ryan, president of Montana’s Anaconda Copper Mining Company (ACM). Ryan had considerable interest in the potential of electrifying the railroad based on his experience with the electrified Butte, Anaconda & Pacific Railroad between Butte and Anaconda. An electrified railroad would require large amounts of copper for the line. Ryan’s interest in electrifying the Milwaukee Road was two-fold – he also owned majority interests in the Great Falls Power Company, the Thompson Falls Power Company, and power companies in Washington State. Because of Ryan’s experience and influence, he was able to convince the Board of Director’s that it would be advantageous for the railroad to make arrangements with existing power companies, like the Great Falls and Thompson Falls firms, to provide energy to the Milwaukee Road rather than construct its own power stations. The directors also determined that it was cost effective to electrify the line over the Rocky Mountains rather than depend on more costly and inefficient steam locomotives, which had limited ranges and required frequent stops to take on fuel and water. The director’s believed, rightly, that electrification would lower costs and improve service. Consequently, in 1912, the railroad decided to electrify its line through the Rocky Mountain Division and contracted with the Great Falls Power Company for electricity to power it; the directors made a similar deal with the Thompson Falls Power Company the following year. The Milwaukee began work on electrifying the Rocky Mountain Division’s 440-mile line in April 1914. Construction involved the installation of 100,000-volt power lines to the substations strung along the line in Montana and Idaho. The line carried a three-phase alternating current (AC) to the substations, where it was stepped down to a 3,000-volt direct current (DC) that was “applied directly to a heavy copper cable paralleling the track . . . and connected to the trolley on two copper wires . . . supported over the center of the track about twenty-five feet about the rail and directly feeding the locomotives the energy needed for propulsion by means of a pantograph.” By use of a regenerative braking system, locomotive systems recovered about sixty percent of the energy required to pull trains upgrade. The first train using an electric locomotive occurred between Three Forks and Deer Lodge, Montana in November 1915 with the entire Rocky Mountain Division electrified in 1916. The following year, the Milwaukee’s Board of Director’s authorized the electrification of the railroad’s line between Othello and Tacoma in Washington State. Company historian, August Derleth, later wrote, The company discovered almost immediately that the operating efficiency – especially of freight trains – under electrification was astonishing. Compared with the operation of steam locomotives, the tonnage per train was virtually doubled, and the operating maintenance expense, owing to the regenerative braking process, was significantly reduced, while the at the same time safety of operation was increased. Overall efficiency was increased to such an extent that, in the initial eight years of operation, the road estimated a saving of $12,400,000 had been effected by electrification. Electrification was an unqualified success, making the Milwaukee Road one of the most technologically advanced railroads in the United States. 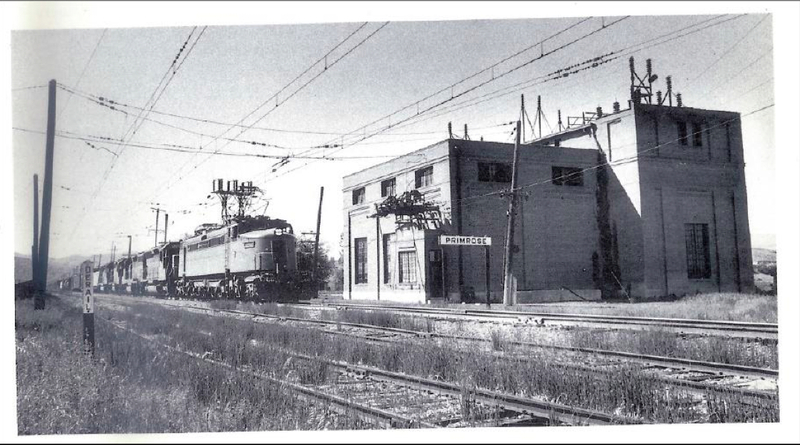 The Milwaukee Road relied on a series of substations to transform the 100,000 volt AC current to a 3,000 volt DC current to power the railroad’s locomotives. General Electric Company electrical engineer A. H. Armstrong and his staff designed the electrical equipment that would be installed in the substations. The railroad ordered the equipment for the stations in November 1914 for delivery in May 1915. The installation of the equipment was supervised by Reinier Beeuwkes, also an employee of General Electric. There were 22 substations, thirteen in Montana and nine in Idaho and Washington. In Montana, the stations were spaced an average of 37.3 miles apart. The stations were substantial brick buildings that housed the motor-generator sets and low tension switching equipment in the front part of the structure and the high tension transformers and switching equipment in the 2½ story section of the building. The motor-generator sets converted the AC to DC that was fed to the locomotives. Substations housed either two or three motor-generator sets, with one functioning as a back-up. Lightning arresters and horn gaps were located on the roof of the transformer section and the power lines were connected to the building through the motor-generator section. The foundations and roofs of the buildings were reinforced concrete and walls comprised of brick. There were two styles of substations designed and built by the Milwaukee Road. The majority were flat-roof buildings, while those in areas of heavy snow-fall had gable roofs. Only the substations at Drexel and East Portal in Montana had gable roofs. Pits were located below the concrete floors. They functioned to aid in air circulation around the electrical equipment. The large windows “are of steel sash construction and are of liberal dimensions and carefully placed to insure good general illumination;” they also functioned to assist air circulation inside the building. The Thompson Falls Power Company fed power into the substation through electrical connectors on the façade of the operations office portion of the building. The operations office contained the switchboard for the motor-generator sets and also functioned as a ticket office and waiting room since most substations also functioned as railroad stations. The extended bay overlooked the track, which enabled the substation operator to “keep in touch with train movements and perform other duties besides those pertinent only to substation operations.” Substations were manned on a 24-hour basis with operators in more remote locations residing in houses near the station. The operators controlled the voltage to the lines feeding electricity to the locomotives, started and stopped the motor-generator sets, and recorded power usage. Originally, locomotives required a minimum of 1,800 volts for power, but that amount was raised to 3,200 volts in the 1950s. Milwaukee Road locomotives were supplied with current by more than one substation at a time to ensure continuity of operation. The utility companies supplied the power at about $.0054 per kilowatt hour. Spur tracks from the main line entered the motor-generator room of each substation. It allowed heavy equipment to be unloaded from railcars with a 10-ton crane inside the building (the crane is still present in the Primrose Substation). In 1948, the Milwaukee Road hired electrical engineer Laurence Wiley to institute low cost changes to the railroad’s Rocky Mountain and Coast divisions (Washington State). In 1950, he devised a method to automate some of the substations and operate them from remote control. Milwaukee Road engineer Earl Barnes developed low cost methods for achieving remote control operations. The first remote control system was installed in the Rocky Mountain Division at Tarkio, about forty miles west of the Primrose substation. It allowed the Tarkio operator to control operations at the Drexel and Primrose stations. Only three substations could be controlled from one spot. By the late 1960s, the railroad’s electrification system was in need of costly upgrades. The trolley wires that carried the electrical current to the locomotives were in good condition, but most of the forty thousand wood poles that carried the wires were in need of replacement. In addition, most of the electric locomotives needed to be replaced. The Milwaukee Road estimated the cost of the upgrade to the system at around $39 million. After considerable debate among the railroad’s board members, they decided to scrap the electrified system as too costly and purchased additional diesel locomotives. Milwaukee Road maintenance crews began removing the wires in 1973. The section including the Primrose substation ceased electric operations in 1974. The railroad sold most of the substation to salvagers, who demolished the buildings. In Montana, only four of the railroad’s thirteen Montana substations escaped the wrecking ball: at Loweth west of Lennep in Meagher County, the Gold Creek substation in Powell County, the Ravenna station between Missoula and Drummond, and the Primrose substation ten miles west of Missoula. The Milwaukee Road was the third and last transcontinental railroad to cross Montana. Established primarily to haul freight, the Milwaukee Road faced declining revenues throughout much of its history in Montana and declared bankruptcy in 1925 and again in 1938. Competition from the Northern Pacific and Great Northern railroads along with cyclical drought and two economic depressions prevented the Milwaukee Road from becoming the cash cow the board of directors envisioned in 1909. After a short boom during the Second World War, the railroad again found itself in dire economic trouble, finally abandoning its lines in Montana in 1980. Section 31, Township 14 North, Range 20 West was initially claimed by the Northern Pacific Railway as part of its 44 million acre Congressional land grant in July 1864. Joseph and Maria Martel had acquired the property from the railroad by 1900. They sold it to Patrick and Louise Lavoie on the last day of December 1901. 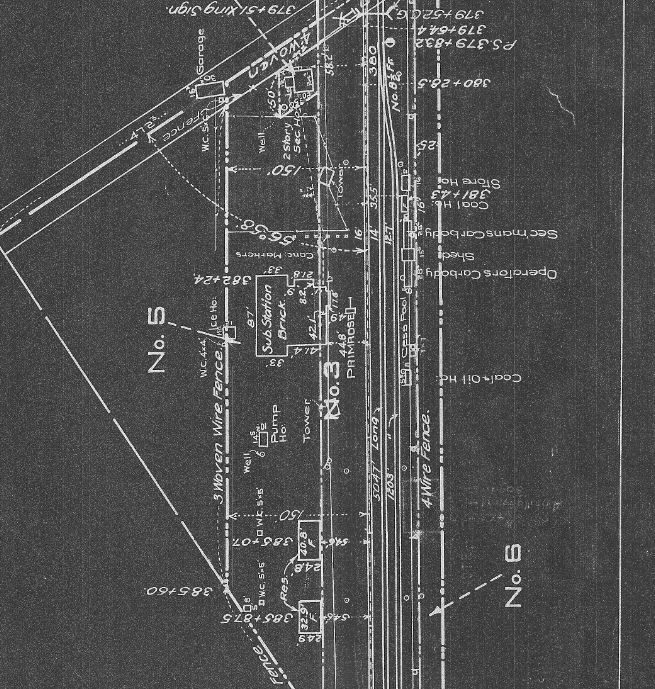 The Lavoie’s sold a strip of Right-of-Way to the Chicago, Milwaukee, & St. Paul Railway Company in March 1907 and then sold 1.4 acres to the railroad for the substation in August 1915. Officially designated Substation Number 10, the Primrose Substation was designed by Milwaukee Road Railroad architects and followed a standard design that was utilized in Montana, Idaho, and Washington. A railroad contractor built the substation out of brick according to the standardized design in 1915. It was the flat-roof architectural design that embodied eleven of the thirteen substations in Montana. The substation was operational by 1916. The station housed two motor-generator sets and employed three men, each working an 8-hour shift. The men lived on-site with their families. The Milwaukee Road established Primrose as a station in 1914 and named it for the plant, which grew profusely in the area. In addition to the substation, the Primrose Substation complex included a water tank, pump house, operator’s car body, shed, two residences, an outhouse, tower, coal and oil house, stone house, ice house, garage, and a two-story section house. The railroad tracks, ties, ballast, and other appurtenances associated with the railroad were removed in the 1980s. In 1951, the railroad automated some of its substations, including Primrose. It was operated remotely from the Tarkio Substation about forty miles to the west. The Primrose Substation remained in operation until 1974, when the Milwaukee Road ceased electrical operations and concentrated on diesel locomotives. The railroad itself declared bankruptcy in 1980 and ceased operations in Montana. Contractors removed the tracks and associated materials in the 1980s and the substation was sold to a private individual. The current owner purchased the building in 2013. ← Chickens Round Two: Fight! Excellent details! I’m interested in spurring community interest for the Loweth substation (perhaps in conjunction with the Gordon Butte Hydro project. You don’t know the owner, do you? The first step I would take is to look the property up on cadastral. Google “Montana cadastral” and it will come right up, but the search functions don’t work well, so I just zoom the map in and look for the building and click, gives all owner information and a lot of county records!